Because I’m working on the Tour de Fleece challenge I’ve been trying to spin every day, but on Sundays I don’t use my spinning wheel. (It’s a personal, peculiar decision I’ve made to not use certain equipment on Sundays. I can’t explain it, my mind just knows which things it has deemed fit or unfit for Sabbath observance.) 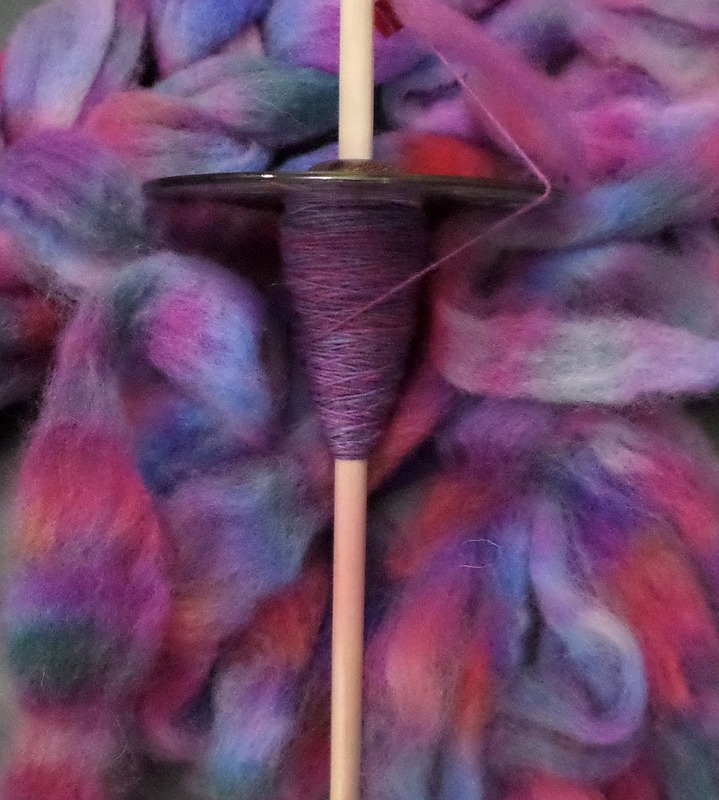 Luckily I had ONE spindle available and I chose to spin this piece of wool (from my recent dyeing practice). Above you can see the original photo, below, the cropped version I posted on Facebook. 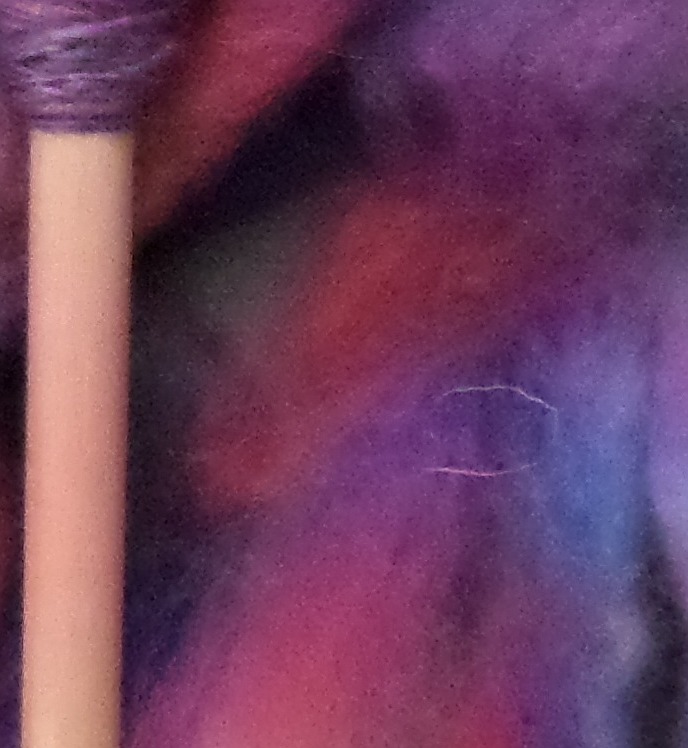 The cropped version was such a luscious photo I shared it not only on my yarn spinning group (Yarn From the Spinning Wheel) but also on my personal timeline. I usually like to leave recent photos open on my computer screen as well, a pleasant reminder of what I’ve accomplished. However, the more I saw the cropped version of the photo, the more my eyes were drawn to one little section of it. Sometimes in wool you’ll find little guard hairs—stiff bits of wool from the animal’s coat. They keep you on your toes while you’re spinning; you pull them out because you don’t want them to end up in the final spun yarn. 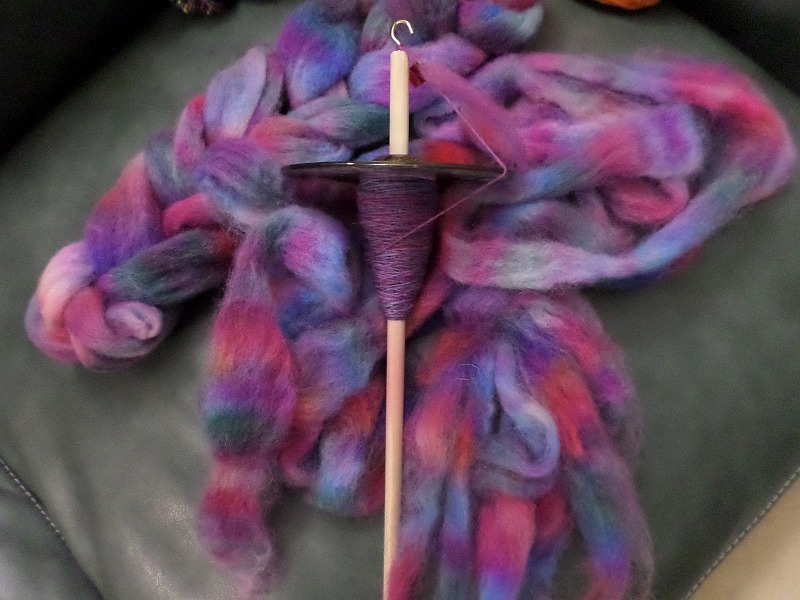 With all the beautiful variations in the colors of the wool, the pretty finespun yarn on the spindle, even the pink residue on the spindle shaft (pink food coloring dye often rubs off onto my hands—good reason to work up the courage to start using my professional quality dyes!) my eyes kept drifting to the aberration, the unwanted thing, the imperfection, the reject. All that good stuff to enjoy, yet my fingers are itching to get at that one hair. So I’m reflecting on that. No one can say I didn’t enjoy the photo; I just told you how much I liked it—posted it in three places (four now). Along with the desire to get that guard hair out of the fiber, I also want to get back to spinning, but while I’m not working on it—while I’m just sitting by, looking on—I’m focused on that guard hair. Human nature tends toward perfection, harmony, unity, I think. But I also think that’s strange because (in general) we prefer variety. We don’t want things to be the same all the time. Don’t want them unpleasant either. Don’t want guard hairs poking into our skin from afghans or shawls that are supposed to feel soft and comfortable. Yes, I’m always going to pull the guard hairs out whenever I find them. And I’ll throw them away because I can’t think of any really good use for them. But I’m also going to try not to lose focus on the big beauty that’s all around me, try not to reject and dismiss what I can’t immediately see a use a for, try not to sit around dwelling on little things. Get up and do something instead. Make more beauty.